I recently had to replace the inner tie rod on my wife’s 2005 Escape. 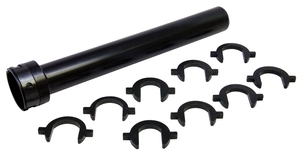 After doing a little research for an inner tie rod tool I found one that had very good reviews and was suppose to work with MOST Ford vehicles. I guess the 05 Escape doesn’t fall into most. The crowsfeet on the tool are made to fit on an inner tie rod that has two flat sides, the tie rod in the Escape was completely round and smooth.